The Big Dog Barn is a brand new luxury dog boarding facility. You will not find a more beautiful, well equipped kennel within Kelowna. There are 5 by 6 foot indoor suites with direct access to private 5 by 12 foot outdoor runs. The indoor suites have beautiful tempered glass frontages and hygienic Wilson Art walls. Also, each suite has its own large bed. Each suite has its own doggie door that leads to their own spacious run. Additionally, this new facility has a huge 16 by 100 foot indoor enclosed arena as well as a massive, fully fenced outdoor area where your dog will have a lot of fun retrieving balls or playing with other dogs. In addition to the regular loving care and playtime your pet will receive with ourselves, and other dogs if permitted, there will be an opportunity for your loved one to take part in private walks throughout the farm for a nominal fee. 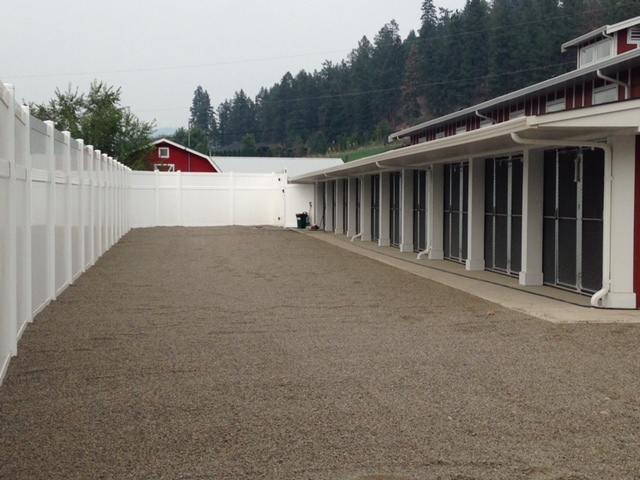 The new Big Dog Barn is now open as of August 2015! (from the same household sharing the same suite). 50% deposit is required upon booking with full refund, less 8% service fee, available up until 72hrs prior to boarding. The daily rate is charged from the day of entry up to and including the day of departure.